A personal digital assistant (PDA), also known as a palmtop computer, or personal data assistant, is a mobile device that functions as a personal information manager. The term evolved from Personal Desktop Assistant, a software term for an application that prompts or prods the user of a computer with suggestions or provides quick reference to contacts and other lists. 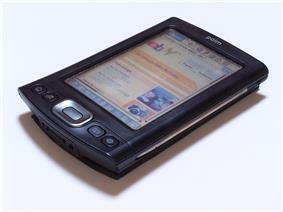 PDAs were discontinued in early 2010s after the widespread adoption of smartphones. The first PDA was released in 1984 by Psion's Series 3, in 1991, which began to resemble the more familiar PDA style. It also had a full keyboard. The term PDA was first used on January 7, 1992 by Apple Computer CEO John Sculley at the Consumer Electronics Show in Las Vegas, Nevada, referring to the Apple Newton. In 1994, IBM introduced the first PDA with full mobile phone functionality, the IBM Simon, which can also be considered the first smartphone. Then in 1996, Nokia introduced a PDA with full mobile phone functionality, the 9000 Communicator, which became the world's best-selling PDA. The Communicator spawned a new category of PDAs: the "PDA phone", now called "smartphone". Another early entrant in this market was Palm, with a line of PDA products which began in March 1996. A typical PDA has a touchscreen for entering data, a memory card slot for data storage, and IrDA, Bluetooth and/or Wi-Fi. However, some PDAs may not have a touch screen, using softkeys, a directional pad, and a numeric keypad or a thumb keyboard for input; this is typically seen on telephones that are incidentally PDAs. In order to have the functions expected of a PDA, a device's software typically includes an appointment calendar, a to-do list, an address book for contacts, a calculator, and some sort of memo (or "note") program. PDAs with wireless data connections also typically include an email client and a Web browser. Handwriting recognition, where letters or words are written on the touchscreen, and the PDA converts the input to text. Recognition and computation of handwritten horizontal and vertical formulas, such as "1 + 2 =", may also be a feature. Despite rigorous research and development projects, end-users experience mixed results with handwriting recognition systems. Some find it frustrating and inaccurate, while others are satisfied with the quality of the recognition. Many touchscreen PDAs support some form of external keyboard as well. Specialized folding keyboards, which offer a full-sized keyboard but collapse into a compact size for transport, are available for many models. External keyboards may attach to the PDA directly, using a cable, or may use wireless technology such as infrared or Bluetooth to connect to the PDA. Newer PDAs, such as the HTC HD2, Apple iPhone, Apple iPod Touch, and Palm Pre, Palm Pre Plus, Palm Pixi, Palm Pixi Plus, Google Android (operating system) include more advanced forms of touchscreen that can register multiple touches simultaneously. These "multi-touch" displays allow for more sophisticated interfaces using various gestures entered with one or more fingers. Although many early PDAs did not have memory card slots, now most have either some form of Secure Digital (SD) slot or a CompactFlash slot. Although designed for memory, Secure Digital Input/Output (SDIO) and CompactFlash cards are available that provide accessories like Wi-Fi or digital cameras, if the device can support them. Some PDAs also have a USB port, mainly for USB flash drives. Some PDAs use microSD cards, which are electronically compatible with SD cards, but have a much smaller physical size. While early PDAs connected to a user's personal computer via serial ports or another proprietary connection, many today connect via a USB cable. Older PDAs were unable to connect to each other via USB, as their implementations of USB didn't support acting as the "host". Some early PDAs were able to connect to the Internet indirectly by means of an external modem connected via the PDA's serial port or "sync" connector, or directly by using an expansion card that provided an Ethernet port. Most modern PDAs have Bluetooth, a popular wireless protocol for mobile devices. Bluetooth can be used to connect keyboards, headsets, GPS receivers, and other nearby accessories. It's also possible to transfer files between PDAs that have Bluetooth. Many modern PDAs have Wi-Fi wireless network connectivity and can connect to Wi-Fi hotspots. All smartphones, and some other modern PDAs, can connect to Wireless Wide Area Networks, such as those provided by cellular telecommunications companies. Older PDAs from the 90s to 2006 typically had an IrDA (infrared) port allowing short-range, line-of-sight wireless communication. Few current models use this technology, as it has been supplanted by Bluetooth and Wi-Fi. IrDA allows communication between two PDAs, or between a PDA and any device with an IrDA port or adapter. Some printers have IrDA receivers, allowing IrDA-equipped PDAs to print to them, if the PDA's operating system supports it. Universal PDA keyboards designed for these older PDAs use infrared technology. Infrared technology is low-cost and has the advantage of being allowed aboard. Most PDAs can synchronize their data with applications on a user's computer. This allows the user to update contact, schedule, or other information on their computer, using software such as Microsoft Outlook or ACT!, and have that same data transferred to PDA—or transfer updated information from the PDA back to the computer. This eliminates the need for the user to update their data in two places. Synchronization also prevents the loss of information stored on the device if it is lost, stolen, or destroyed. When the PDA is repaired or replaced, it can be "re-synced" with the computer, restoring the user's data. Some users find that data input is quicker on their computer than on their PDA, since text input via a touchscreen or small-scale keyboard is slower than a full-size keyboard. Transferring data to a PDA via the computer is therefore a lot quicker than having to manually input all data on the handheld device. Microsoft Windows Mobile Device Center for Windows Vista, which supports Microsoft Windows Mobile and Pocket PC devices. These programs allow the PDA to be synchronized with a personal information manager, which may be part of the computer's operating system, provided with the PDA, or sold separately by a third party. For example, the RIM BlackBerry comes with RIM's Desktop Manager program, which can synchronize to both Microsoft Outlook and ACT!. Other PDAs come only with their own proprietary software. For example, some early Palm OS PDAs came only with Palm Desktop, while later Palm PDAs—such as the Treo 650—have the ability to sync to Palm Desktop or Microsoft Outlook. Microsoft's ActiveSync and Windows Mobile Device Center only synchronize with Microsoft Outlook or a Microsoft Exchange server. Third-party synchronization software is also available for some PDAs from companies like CommonTime and CompanionLink. Third-party software can be used to synchronize PDAs to other personal information managers that are not supported by the PDA manufacturers (for example, GoldMine and IBM Lotus Notes). Some PDAs can synchronize some or all of their data using their wireless networking capabilities, rather than having to be directly connected to a personal computer via a cable. Apple iOS devices, like the iPhone, iPod Touch, and iPad, can use Apple's iCloud service (formerly MobileMe) to synchronize calendar, address book, mail account, Internet bookmark, and other data with one or more Macintosh or Windows computers using Wi-Fi or cellular data connections. Devices running Palm's webOS or Google's Android operating system primarily sync with the cloud. For example, if Gmail is used, information in contacts, email, and calendar can be synchronized between the phone and Google's servers. RIM sells BlackBerry Enterprise Server to corporations so that corporate BlackBerry users can wirelessly synchronize their PDAs with the company's Microsoft Exchange Server, IBM Lotus Domino, or Novell GroupWise servers. Email, calendar entries, contacts, tasks, and memos kept on the company's server are automatically synchronized with the BlackBerry. Microsoft Windows Mobile (Pocket PC) with a Windows CE kernel. Some PDAs include Global Positioning System (GPS) receivers; this is particularly true of smartphones. Other PDAs are compatible with external GPS-receiver add-ons that use the PDA's processor and screen to display location information. PDAs with GPS functionality can be used for automotive navigation. PDAs are increasingly being fitted as standard on new cars. PDA-based GPS can also display traffic conditions, perform dynamic routing, and show known locations of roadside mobile radar guns. TomTom, Garmin, and iGO offer GPS navigation software for PDAs. Some businesses and government organizations rely upon rugged PDAs, sometimes known as enterprise digital assistants (EDAs), for mobile data applications. EDAs often have extra features for data capture, such as barcode readers, radio-frequency identification (RFID) readers, magnetic stripe card readers, or smart card readers. Many companies have developed PDA products aimed at the medical profession's unique needs, such as drug databases, treatment information, and medical news. Services such as ward rounds. Pendragon and Syware provide tools for conducting research with, allowing the user to enter data into a centralized database using their PDA. Microsoft Visual Studio and Sun Java also provide programming tools for developing survey instruments on the handheld. These development tools allow for integration with SQL databases that are stored on the handheld and can be synchronized with a desktop- or server-based database. PDAs have been shown to aid diagnosis and drug selection and some studies have concluded that when patients use PDAs to record their symptoms, they communicate more effectively with hospitals during follow-up visits. The development of Sensor Web technology may lead to wearable bodily sensors to monitor ongoing conditions, like diabetes or epilepsy, which would alert patients and doctors when treatment is required using wireless communication and PDAs. As mobile technology becomes more common, it is increasingly being used as a learning tool. Some educational institutions have embraced M-Learning, integrating PDAs into their teaching practices. PDAs and handheld devices are allowed in many classrooms for digital note-taking. Students can spell-check, modify, and amend their class notes on the PDA. Some educators distribute course material through the Internet or infrared file-sharing functions of the PDA. Textbook publishers have begun to release e-books, or electronic textbooks, which can be uploaded directly to a PDA, reducing the number of textbooks students must carry. Software companies have developed PDA programs to meet the instructional needs of educational institutions, such as dictionaries, thesauri, word processing software, encyclopedias, and digital lesson planners. PDAs may be used by music enthusiasts to play a variety of music file formats. Many PDAs include the functionality of an MP3 player. Road rally enthusiasts can use PDAs to calculate distance, speed, and time. This information may be used for navigation, or the PDA's GPS functions can be used for navigation. Underwater divers can use PDAs to plan breathing gas mixtures and decompression schedules using software such as "V-Planner." As of today, any smartphone can do this as well. ^ Kot, Chelsea (July 11, 2011). "A Brief History of Tablets and Tablet Cases". Tablets2Cases. Retrieved December 10, 2011. ^ Viken, Alexander (April 10, 2009). "The History of Personal Digital Assistants 1980 – 2000". Agile Mobility. Retrieved February 18, 2011. ^ Andrew Smith, Faithe Wempen (2011). CompTIA Strata Study Guide. John Wiley & Sons. p. 140. Kahney, Leander (August 29, 2002). "Apple's Newton Just Won't Drop". Wired. Condé Nast Publications. Retrieved August 21, 2010. Blickenstorfer, Conrad M. (June 2000), From the editor: Commentary by Pen Computing Magazine's editor-in-chief (34), I have used [handwriting recognition] for years, taking notes during lectures and often writing whole articles while on airplanes. See user testing results discussed in part 6 of: Yaeger, Larry S; Webb, Brandyn J; Lyon, Richard F. "Combining Neural Networks and Context-Driven Search for On-Line, Printed Handwriting Recognition in the Newton" (PDF). A.I. Magazine. Wittmann, Michael C. "What's Right With The Newton: Part I: Handwriting recognition". Retrieved August 21, 2010. ^ Patrick (December 14, 2006). "Palm PDA Cables". DeepWave. eHow.com. Retrieved August 21, 2010. ^ "BlackBerry — Enterprise Server — BlackBerry BES Server". Research In Motion. Retrieved August 21, 2010. ^ "10 tips to save on college textbooks". Centre Daily Times. August 20, 2010. Retrieved August 21, 2010.